Here is a countdown to want I think is the best stomach exercise / best ab exercise. I originally wanted to make a list of my Top 10 Stomach Exercises, but I just couldn't narrow it down enough. So instead of 10 here's 12. Of course, the list is just my opinion both as a personal trainer and as someone who likes to exercise. I'll do my best to explain why each ab exercise is on the list of my favorite exercises. Sit ups are a great stomach and ab exercise. They have fallen out of favor amongst personal trainers and physical therapists because they do put more pressure on your back than regular floor crunches. But that doesn't mean that sit ups are bad for everyone. If you are an athlete (recreational or organized team), who has good flexibility, good stomach strength, no previous injury to your lower back, strong lower back muscles, and good sit up technique, you can actually improve your speed and sports performance by including sit ups in your stomach workout. However, if you have had a significant back injury, have poor flexibility in your hips and spine, poor stomach strength, and a weak lower back sit ups might not be the best stomach exercise for you. Crunches limit your range of motion and only work on the abdominals. However, sit ups strengthen the stomach muscles through a larger range of motion and also strengthen the hip flexor muscles-- important muscles for speed. In my work, I generally do not work with athletes, so I don't often recommend full sit ups. And, that is why I only listed sit ups as the #12 best exercise. 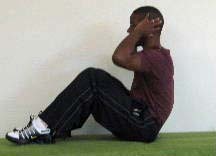 Regular Floor Crunches are one of the first exercises that I teach new clients. When I meet people who are new to exercising, I always want them to master the basics first before moving on to more complicated and challenging ab exercises, and floor ab crunches are a great place to start. When I watch clients perform stomach crunches for the first time, I can get a sense of how well their body moves, and I also get an idea about their technique. Crunches don't nearly put as much pressure on your lower back as sit ups, so I tend to recommend ab crunches more often than full sit ups. Ab crunches might appear higher than #11 on other people's lists of top stomach exercises. But I have found that because so many people have stiff lower backs, it is hard for them to perform the correct technique, and they usually have excess tension in the neck. Also, the floor limits the range of motion through the spine, so crunches generally work through a small range of motion. Lastly, crunches tend to get easy really fast, and I usually find myself recommending more challenging ab exercises after 3-6 weeks. For those reasons, traditional floor crunches are only listed at #11. When I work out at a gym, I sometimes incorporate hanging reverse crunches in my own personal stomach workout. I personally like this ab exercise, but it has some drawbacks. First, I will say that anytime you lift your legs you will have more pressure on your back. Your stomach muscles have to stabilize your back and keep it in a good position when your legs are moving, and since our legs are so heavy extra tension is placed on the lower back when we lift our legs. A quick tip for this abdominal exercise is to keep your knees bent throughout to take some pressure off your lower back (versus keeping your legs straight as you lift them). Another drawback is that you have to hold yourself up in the correct position. If you do not have good upper body strength, you may find yourself focusing on your shoulders and not your legs and stomach. If you have good upper body strength and no major problems with your lower back, hanging knee raises can be a good stomach exercise for you. But because of the drawbacks and the large piece of equipment required, Hanging Knee Raises is only #10 on my list. The Plank Pose is a popular exercise that was made famous by yoga but has crossed over to general fitness. I actually really like this core exercise and make nearly all of my clients perform it at one point during our training sessions. One of the reasons that I like the plank is that it really focuses on increasing core stabilization to protect the lower back from injury. In the plank position, you must focus on pulling your belly button in to brace your lower back and stop it from arching. When the lower back arches excessively more pressure is placed on the joints in the spine. As a physical therapist, I really like the plank and highly recommend the regular plank or any other variation to increase core stability. As a personal trainer, I really like the plank because of the mental challenge. When you're holding the correct position, your body may start shaking after a few seconds, and you have to mentally toughen up, focus, and breath until the stop watch let's you quit. I really like the plank, but it's only #9 on my list. And, remember no exercise by itself is good or bad. 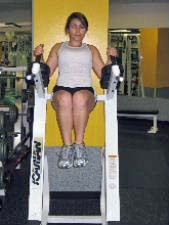 Each abdominal exercise has strengths and weaknesses, pros and cons. The best ab exercises for me may be different from the best ab exercises for you. To get even more perspective on this topic read my article on Finding the Best Abdominal Exercise for You or read my review of a scientific study on the most effective abdominal exercises.